Organ regeneration--developing bio-artificial replacement organs-- was the subjcct of a three-part New York Times series last week (which mentioned in an earlier post here), and there are related items to come on other instances of real-world organ regeneration, tissue engineering, and other forms of regenerative medicine to come in this blog. "The discovery of a rapidly-spreading basal cell cancer in her ear in 2008 required the removal of part of her ear, part of her skull and her left ear canal. But now, in a groundbreaking and complicated set of surgeries, Johns Hopkins doctors have attached a new ear made from Walters’ own tissue. “I thought of this exact strategy many years before and really was looking for the right patient to try it on,” said renowned plastic and reconstructive surgeon Dr. Patrick Byrne. “We started making jokes just to try to get used to it and I was like, `Can you hear me? Can you hear me?’ said Sherrie’s husband, Damien." Given that the family is comfortable enough now to joke, let me add this one: You've heard the old saying about wearing your heart on your sleeve? Well, here's a case of wearing your bio-artificial ear on / under your sleeve. Organ regeneration and other aspects of regenerative medicine form one of the strands in my technothriller A REMEDY FOR DEATH. Just how organ regeneration (also termed tissue engineering) fits into A REMEDY FOR DEATH I'll skip here now, but it is interesting to see the Times picking up on the possibilities--- which I've been following for quite a long time. (Since way back 20-plus years ago when I first got the idea for the book.) I'll be posting more of my research and idea sources here in various posts. So in this case, they created a synthetic scaffold, using plastic polymers. It was a perfect fit, as it had been custom-created for this patient. But that was only part of the challenge. The next part was getting tissue to grow around that scaffold. I'll leave you to the article for that, except to say that they used the patient's own stem cells as "seeds", which worked well, and hence there was no need to use drugs to fight off rejection, as there would have been had cells from another person been used. That part went well, but not exactly as planned. Organ regeneration -- tissue growth -- proceded, but in a different way than expected. Dr. Macchiarini, leader of the project, said, "We are far away from understanding the process. Far, far away." Dr. Macchiarini's "ultimate dream is to eliminate even the synthetic scaffold. Instead, drugs would enable the body to rebuild its own scaffold." As he put it, the ideal would be if we "don't touch the patient. Just use his body to regenerate his own organ. It would be fantastic." That New York Times article again. 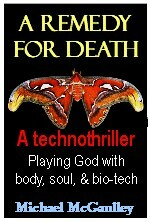 My technothriller via Amazon, A REMEDY FOR DEATH -- Playing God with Body, Soul, and Bio-tech.